After my last update on Mauna Loa, I thought I was almost done and that attaching the ferns and flowers would have been just a day or two of work. Wishful thinking! Attaching the embellishments turned out to be a major pain. The ferns are as floppy as fringes, so I had to stitch them down also from their tips, not just the bases (otherwise they would have twisted and hanged down towards the bottom of the necklace). Wouldn't have been a big deal, if I'd planned it in advance and I had left one of the threads at their tips, instead of passing it through the center to bring it down at the base with the other end thread. Fortunately I still had enough space inside those 15/0s to make another passage and bring it carefully back up to the tips. I also had to build a sort of "lava" nest around the Proteas to secure them in a way that they would stand up without moving around. The whole process took a long time, especially because several places in the base necklace had the beads already stuffed with thread passages and I wanted to secure everything passing through it at least twice. 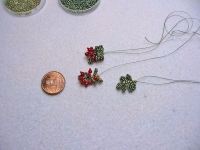 Anyways...the necklace is almost done, but I still have a couple of places that look bare and I don't like the way the ferns look in those spots, so I decided to make some Ohelo Berries to fill those areas. I had to fiddle around a little to figure out how to make the tiny oval leaves, but I'm happy with the end result.